I am very fortunate to have the opportunity to see the inheritance pattern of a great grandchild in my known relative studies at 23andMe, so I decided to share it. For those of you who are not familiar with the 23andMe user interface, the above chart is an illustration of the 23 pairs of chromosomes that we all possess. For simplicity, only one chromosome is displayed to represent each pair, thus the 23 bars. 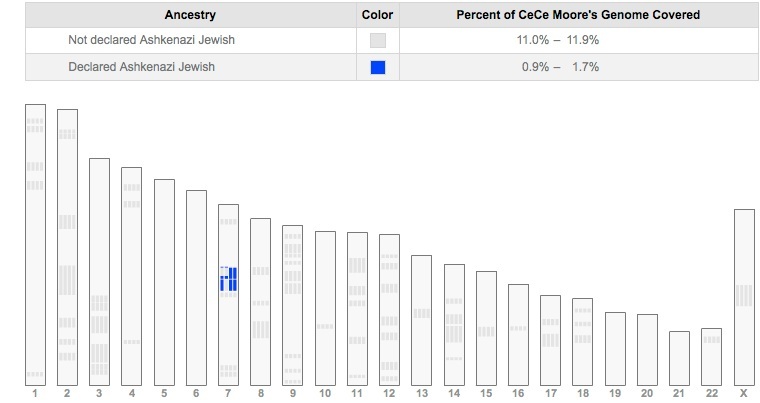 Using the Family Inheritance Advanced tool one can choose to compare selected individuals and a chart is generated to illustrate the shared DNA between them. In this chart, the light blue is the shared DNA with the mother, the light green is the shared DNA with the grandmother and the dark blue is the shared DNA with the great grandmother. Of course, the parent and child (light blue) share DNA across all 23 of the chromosomes, as would be expected. This represents the 50% of shared DNA between the child and parent. The grandparent and child (light green) usually would share approximately half as much DNA with the stretches being broken up into smaller blocks. In this case, the child inherited a larger than expected amount of shared DNA with the grandparent at 31.54% (expected ~25%). The great grandparent and child (dark blue) should share approximately half as much DNA as the child and the grandparent, with the blocks broken up into even smaller fragments of shared DNA. In reality, the percentage is less than half at 14.75% of shared DNA, which is still rather high compared to the norm (expected ~12.5%). As you can see, the percentages will vary from the expected values. Notably, 31.54% is the highest sharing I have seen between a grandparent and child in my research so far. Since the child inherited 50% from the maternal side, there is only ~18.46% that could have been inherited from the other maternal grandparent, which is well below the expected 25%. Notice that as the relationship gets more distant, in general, the shared blocks of DNA get smaller, disappearing completely on some of the chromosomes. On Chromosome 13, there are no stretches of shared DNA (that meet the threshold for this tool) between the grandparent and child. This means that on Chromosome 13, this child has inherited significant DNA from the other grandparent's ancestors (in this case, the maternal grandfather). Following this same pattern, on Chromosomes 6, 13 and 14, the great grandparent and child do not have any significant blocks of DNA. Also notice on Chromosome 10, the grandchild inherited the entire maternal grandmother's chromosome (light green across the entire bar). That means that Chromosome 10 has no (significant) DNA from the maternal grandfather. Please remember that, in this case, we are only looking at half of the child's chromosomes. The child has another set of 23 chromosomes inherited from the father. Since we are not comparing the child with any paternal relatives, none of those chromosomes are represented in this chart or analysis. I have had quite a few known relatives test with 23andMe recently. In the coming months, I will be writing a number of posts based on these results. As an introduction, I wanted to review some of the information that 23andMe and FTDNA provide in their FAQs regarding their autosomal DNA tests, Relative Finder and Family Finder. All of these percentages are estimates and will vary due to the random nature of genetic inheritance. The following statistics apply to both 23andMe's Relative Finder (RF) and FTDNA's Family Finder (FF). In some families, there will be situations that will complicate the above predictions, such as cousin marriages and half-siblingship, but, in general, they are the guidelines that should be used in analysis and comparisons. Known Relative Studies: I Found My Third Cousin Today! Some time ago, I ran my raw 23andMe data through the Euro DNA Calculator Application. 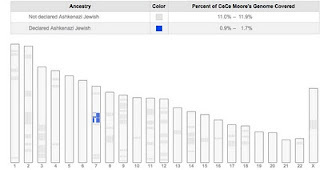 (Euro-DNA-Calc, compiled by Dienekes Pontikos, computes an admixture estimate with Northwestern European, Southeastern European, or Ashkenazi Jewish parental populations. The calc uses 300 markers from a scientific study.) 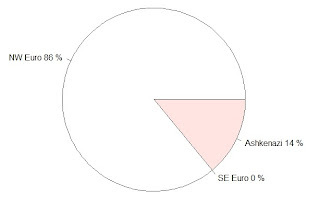 I was surprised to find that it estimated 86% NW European and 14% Ashkenazi for me. 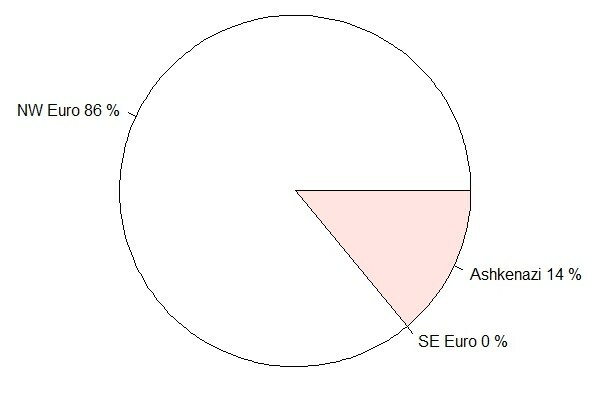 Interestingly, my mother showed no Ashkenazi at all in her results with a 100% NW European prediction. Since I have no known Jewish heritage, after some research into the application, I disregarded it. 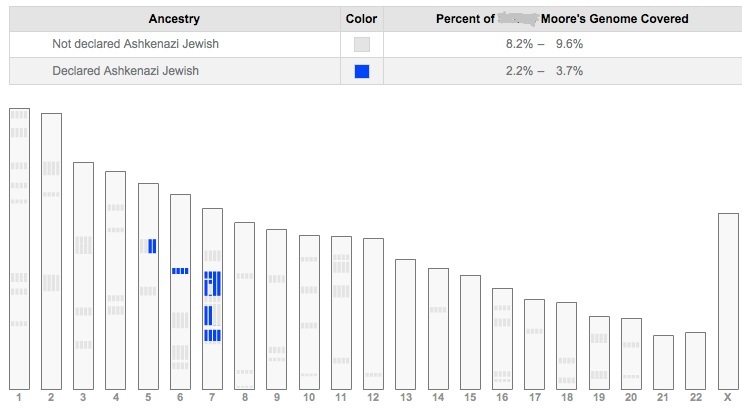 When 23andMe's Ancestry Finder was launched and began noting Ashkenazi segments, I noticed a spot on my Chromosome 7 that appeared to have a clump of self-declared Ashkenazi matches. 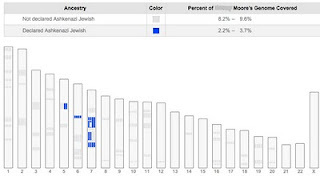 When 23andMe started providing the download of the matches associated with Ancestry Finder, I saw that I had no less than 21 "Ashkenazi" matches on Chromosome 7 between 53.3m and 94.3m. My mother had none. These matches all appeared to be rather small and only on that one spot, but it did get me thinking about the possibility of distant Jewish ancestors again. Since my father is deceased, I asked my paternal uncle to test in his place. Yesterday, I received his results. There, clear as day, on his Chromosome 7 appears that same Ashkenazi clump that I have (plus a little more: he has 37 self-described Ashkenazi matches on Chromosome 7 on the Ancestry Finder download). Equally as significant, I could immediately see that he has a number of Public Matches in Relative Finder who list their ancestry as Jewish. Most of them are predicted as "Distant Cousin", which probably explains why they didn't show up in my Relative Finder. In this case, testing just one more generation back revealed very useful information. While this Ashkenazi ancestry is clearly quite distant, it certainly appears to be authentic after all. 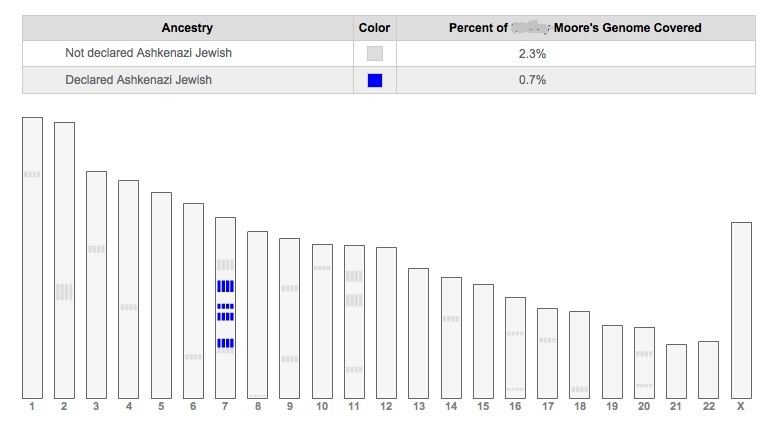 Although the Euro DNA Calc greatly overestimated the likely percentage, it does seem to have picked up on legitimate Ashkenazi markers in my DNA. I had long suspected that Cousin E and I were related on both sides of my family, but didn't have proof until today. On Relative Finder, I match Cousin E on two segments, but she only matches my mother on one. The other segment was a fairly small one (7cMs), so I thought it could possibly have just been missed. I was curious and wanted to find out. My father is deceased, so I recently asked my paternal uncle to test at 23andMe in the place of my father. Today, I received his results. Sure enough, he too matches Cousin E! 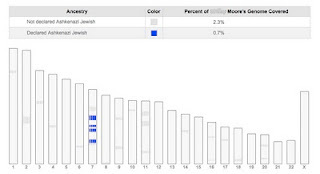 The dark blue on the chart above signifies the areas that my DNA matches Cousin E. The green is where my mother matches E and the light blue is where my paternal uncle matches E. As one can see, my uncle and myself share the match with E on Chromosome 5 (represented by the bar with the number 5), and my mother and I share the match on Chromosome 7 (represented by the bar with the number 7). Therefore, the matching segment on Chromosome 5 was inherited through my father's ancestry and the match on Chromosome 7 was inherited through my mother's ancestry. Cousin E and I have not determined our exact connections yet, but we do share Finnish ancestry from the same area (my mom's side) and New England Colonial ancestry (my father's side), so the matches do seem to make sense. We are predicted to be 4th Cousins (3rd to 5th) based on our two matching segments and .37% shared DNA. Since the two segments are obviously inherited from two different ancestors, our likely connection is further back. My mother is predicted to be a 4th Cousin (3rd to 7th) to Cousin E with .28% shared DNA and my uncle is predicted to be a 7th Cousin (4th - 10th) to Cousin E with .09% shared DNA. I posted yesterday about 23andMe's new Personal Genome Service subscription plan. Since then, there has been a lot of speculation about this new service and many existing customers are concerned about the potential of having to pay for continuing access to their results and new matches. As I pointed out before, the subscription is NOT required for the Ancestry Edition, which leads me to believe that it has nothing to do with access to future matches and Ancestry services. I am going to go out on a limb and say that I am confident that existing customers will not be charged to see their results in the future. I think this move would earn 23andMe so much bad press and ill will that it would ruin them. I trust they will not alienate their existing, loyal customer base. This is an innovative company with a goal to grant each individual access to their personal genome. Just like Google's mission is to "democratize information," 23andMe's mission is to make genetic information available to the masses. To continue to make this fiscally possible, they must be profitable. They are simply testing marketing strategies in line with those goals. This is a proactive and, possibly, necessary marketing move. Lower upfront prices will result in more customers. Think of the "subscription" as a payment plan. When we at StudioINTV run the direct response ads that we produce, we test many different price points and payment plans. Continuity is a proven money maker and a necessity for success in some campaigns. I really believe 23andMe is just testing the waters and trying to determine what "plan" results in the most customers. Not everyone has $500 upfront and that big ticket price sometime scares away even those who do. Business as usual, ladies and gentleman. no need for panic. Thank you for contacting us. We're happy to clarify for you. --- 23andMe would like to make our service accessible to as many people as possible. To that end, we are currently exploring the viability of a lower entry point. This pricing will be available for a limited time. --- Multi-kit discounts do not apply to the subscription edition of the service. The multi-kit discounts will still apply to Ancestry Edition (at $229), the Health Edition (at $429) and the Complete Edition (at $499). The discount is $25 off per kit for Ancestry or Health when you purchase two or more and $50 off per kit for Complete when you purchase two or more. Today 23andMe has announced their new Personal Genome Service in conjunction with the sale price of $229 for either the Health or Ancestry Editions and $299 for the Complete Edition. In order to qualify for the sale price, the Health and Complete Editions require a minimum 3-month subscription commitment to this new service at $5/per month. Apparently, the Ancestry Edition does not. (This may lead to speculation that the new service has something to do with the impending FDA regulations.) Since this sale is a test it could end at any time. A rep at 23andMe told me that the goal is "to get this (their product) into as many people's hands as possible, so we'll periodically do some testing of lower price points." Beyond that, the representative declined to elaborate at this time.